These skilled and seasoned performers know how to engage and entertain, delighting audiences for over nine years. They have been perennial favorites at the Seattle Folklife Festival, featured at the Vancouver, BC, Celtic Fest and repeat performers at the highly-regarded Yachats Celtic Festival. With several CDs to their credit, Fiddlehead enjoys a strong following among music-lovers in the Northwest. 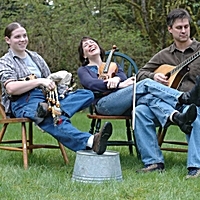 Widely known for their sense of fun on stage, tight, innovative arrangements, and remarkable ability to produce a huge sound for a trio, Fiddlehead delivers songs and tunes using a wide variety of traditional instruments. Their deep knowledge of the music and enthusiasm for performing is one of the hallmarks of this band, and they communicate that joy directly to the audience. Anthea Lawrence, fiddle and vocals, has been called “one of the rising stars of Northwest Irish music.” A former member of the internationally recognized Irish band Slainte, her powerful fiddling and sweet voice have met with critical acclaim. In addition she is a well-respected teacher, giving workshops and teaching at music camps throughout the Western US. Audra Poor is a young powerhouse on her instrument of choice, the Irish Uillean pipes, as well as a skilled musician on the flute and pennywhistle. She plays all three with finesse and style that is creating quite a buzz on the traditional music scene. Lawson Dumbeck is a talented multi-instrumentalist. Whether he is finger-picking a sweet air on guitar, providing stirring bouzouki back-up for fiddle tunes, playing a set of polkas on the banjo, or accompanying with complex rhythms on the bodhran, he brings freshness and drive to the music. Listen to a sample of our music! Are you performing during the St Pat’s weekend in the South Sound?